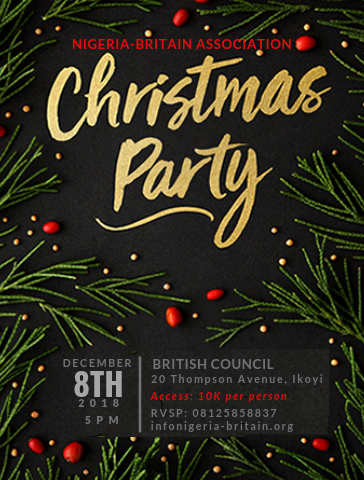 It is Christmas time once again and we are pleased to invite you to attend the 2018 N-BA End of The Year Dinner/Party. As 2018 winds down, let’s have some good cheer as we treat ourselves to some good food and drinks, Limbo dancing, Electric Dance, a fun Grab-The-Mike Karaoke contest with cool prizes, Rum Punch and lots more! All attendees will automatically qualify for getting a 10% discount on ALL British Airways Flight Tickets to Europe courtesy of British Airways. In line with this, we have reserved a seat for you for a fee of N10,000 and a Prompt confirmation of your interest and availability to attend this upcoming event will be highly appreciated as spaces are limited and will be on a first come first serve basis upon payment. Kindly see attached the invitation for your use. We look forward to your kind cooperation and also to receiving you at what promises to be a very engaging evening.